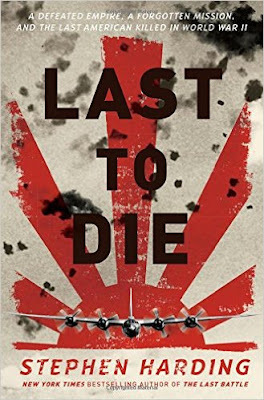 Veteran journalist and author Joseph C. Goulden offers a good review of Stephen Harding's Last to Die in the Washington Times. Given that Japan started the Pacific War with a cowardly sneak attack on Pearl Harbor, it comes as small surprise that the last American to die in the war was killed by military extremists after both sides had agreed to end hostilities. The victim, one of more than 800,000 casualties in the Pacific theater during the war, was Anthony James Marchione, born to Italian immigrant parents in Pottstown, Pa. Machine gunfire killed him six days after his 20th birthday while on a reconnaissance mission to determine whether the Japanese military was abiding by the cease-fire. Stephen Harding, the editor of Military History, is fast achieving a reputation as a World War II historian of the first order. In engrossing and well-researched prose, he tells a two-tier story. First is that of Marchione, a youngster who was determined to fight for his country, only to die after peace had supposedly come. (A photo of a smiling Marchione brought a lump to the throat of this father). Then there is the saga of hard-core Japanese militarists who adhered to the “bushido code,” which equated surrender with cowardice, and who tried to thwart Emperor Hirohito’s decision to spare his country further devastation. One senior air officer pointed to the 5,300 kamikaze aircraft “hidden from Allied eyes in caves, underground storage areas, and heavily camouflaged airfields across southern Japan,” awaiting suicide pilots. Last-ditch defense intentions were obvious to U. S. ground troops (see, for instance, George Feifler’s 1992 book “Tennozan: The Battle of Okinawa and the Atomic Bomb”).